Congratulations :-) with your 25th birthday! You all know him and you've probably used him many times: The smiley, a.k.a. the happy face. It's the combination of three characters that together form an emoticon. And yes, it's his birthday today (19th of september), so let's congratulate him all with his 25th birthday! 25 years ago professor Scott E. Fahlman created the smiley :-). On the 19th of September 1982 on 11:44, he invented this internet classic. It's now used all around the world by poeple that digitally (Text messaging, Chat etc.) want to express themselves when a plain text simply isn't enough. Fahlman had enough of the readers of the forum on his university, because they didn't understand the irony of the post. "I suggest you use the following symbol when making a joke: :-) . Read it when tilting your head to the left." Fahlman immediately suggested to use the :-( emoticon too, but that turned fast in the use when someone wanted to express sadness or anger. Within several months many users came up with new symbols. "I wonder how many people have used this emoticon" is what Fahlman wonders. "How many people have turned their had to view this smiley in the past 25 years." There are many forms of smileys these days. Windows Live Messenger automaticly changes the :-) combination in one of their own emoticons. "It's too bad, it removes the jolly effect from the emoticon." according to Fahlman. 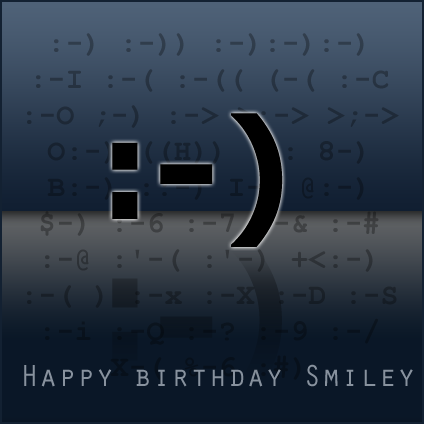 So, for all the emoticon users in the world: Congratulations with the birthday of your little friend! The : -) is 25; inventor tells how it was born.